The Knights of the Order of Calatrava, called after this city—who received large estates and gifts from the kings of Castile and Aragon—and their grand masters had various relations with the Jewish communities and individual Jews. The city Maqueda was a fief of the order, and was the home of the scholarly Moses Arragel, with whom the grand master Luis de Guzman corresponded. In 1316 the grand master Garcia Lopez interceded for the Jewish community, by asking the king, Alfonso XI., to reduce the royal taxes. In 1304 the Order of Jaime II. 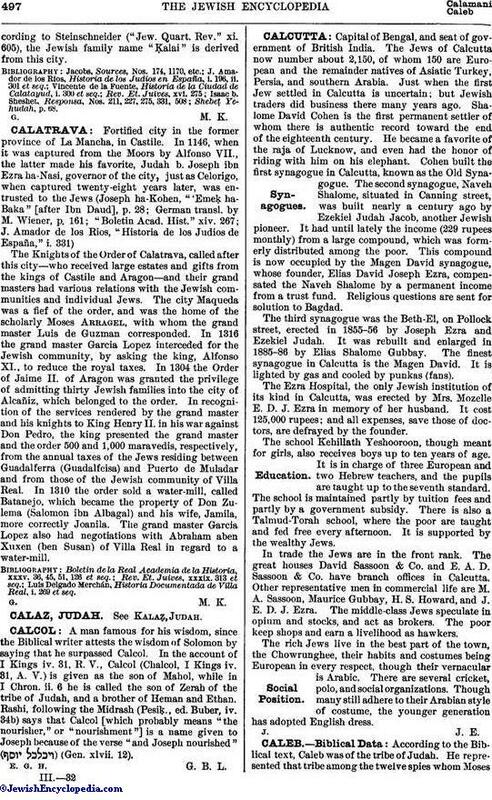 of Aragon was granted the privilege of admitting thirty Jewish families into the city of Alcañiz, which belonged to the order. In recognition of the services rendered by the grand master and his knights to King Henry II. in his war against Don Pedro, the king presented the grand master and the order 500 and 1,000 maravedis, respectively, from the annual taxes of the Jews residing between Guadalferra (Guadalfeisa) and Puerto de Muladar and from those of the Jewish community of Villa Real. In 1310 the order sold a water-mill, called Batanejo, which became the property of Don Zulema (Salomon ibn Albagal) and his wife, Jamila, more correctly Joanila. The grand master Garcia Lopez also had negotiations with Abraham aben Xuxen (ben Susan) of Villa Real in regard to a water-mill. Luis Delgado Merchán, Historia Documentada de Villa Real, i. 269 et seq.